Harvard's First Generation Student Union hosts events like the first gen welcome event for freshmen. advocating on behalf of first-generation students. 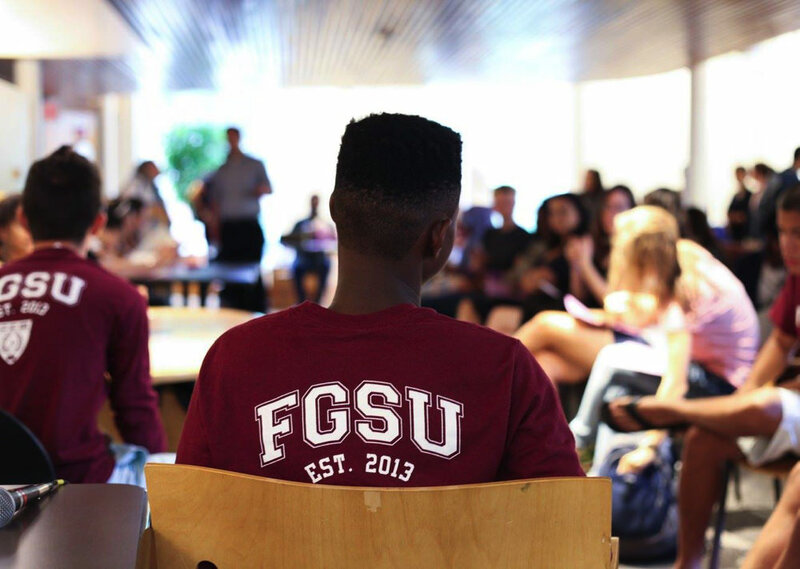 This past spring, FGSU’s advocacy made it a household name in dining-hall conversations as proposals for a “bridge program” were debated across campus. The calls for such a program, and the general conversation concerning the needs of students who are the first in their families to attend college, reflect the growing salience of that cohort—now 15 percent of Harvard undergraduates. The College has enrolled many more such students in the last decade, since the 2004 launch of the Harvard Financial Aid Initiative (HFAI), which now eliminates the cost of attending for children from families earning less than $65,000. But the student body as a whole still skews heavily to upper-income families—and, as the College aims to embrace more lower-income and first-generation students, it has also had to reckon with the challenges of integrating an economically diverse student body both socially and academically. He does note that although first-generation status is a useful proxy for low-income status, the two categories aren’t the same. And some low-income students at schools like Harvard—dubbed the “privileged poor” by Anthony Jack, a Junior Fellow and an assistant professor of education at the Harvard Graduate School of Education—have attended elite high schools and mastered the unspoken, non-academic challenges of college. Nontheless, 98 percent of first-generation students in the class of 2019 receive financial aid, according to Niki Applebaum-Johnson, assistant director of financial aid, senior admissions officer, and director of the Harvard First Generation Program (an admissions-office effort that provides information about Harvard’s resources to prospective first-generation college students). Proposals for a bridge program vary widely, depending on advocates’ perception of first-generation students’ needs. The FGSU, according to vice president Charity Barros ’18, imagines a voluntary pre-orientation program to help incoming freshmen learn about “the cultural transition” of attending college; it would address some of the points Peréz and Jack make, such as learning to reach out to professors and attend office hours. Other proposals focus on the transition to college-level academic work—the most difficult challenge of beginning college for first-generation students, according to a Pell Institute study. Yale has a five-week summer bridge program that combines both these goals. The 60 students attending its First-Year Scholars Program take a writing seminar and mini STEM classes (either through a set curriculum designed within the school’s quantitative-reasoning curriculum, or an individualized schedule). They also learn about academic advising, library collections, and internship and career services. At Princeton’s Freshman Scholars Institute, incoming first-generation and low-income students spend seven weeks participating in a seminar class and a quantitative class, and learn about advising, academic resources, and extracurricular organizations. Whether they span several weeks or a few days, or focus on academics or Barros’s cultural transition to college, bridge programs broadly provide support and a social network for first-generation students. An Enrichment Program, or a Staff Advocate? Lobo recalls the conversations about a bridge program that took place when he was an undergraduate—when, he says, he knew the College administration was not ready to decide if it wanted to proceed in that direction. One of the first proposals was designed by Savannah Fritz ’17, who won an Undergraduate Council (UC) grant in April 2015 to develop her “Freshman Enrichment Program” (FEP). The first from her high school to attend an Ivy League university, Fritz says that she “wanted to design a program someone like me could’ve benefitted from.” Though she wanted a program five to seven weeks long, she and nine other students designed an eight-day pre-orientation program that included academic workshops on college writing and time management, meetings with counselors, team-building exercises, and introductions to offices such as the Bureau of Study Counsel (BSC), Freshman Dean’s Office (FDO), Financial Aid Office, and Office of Career Services. The FEP was never realized, but, according to a Harvard Crimson story, it formed the basis for another proposal created by Katie Steele, director of college initiatives and student development in the FDO. The resulting “First-Year Institute” was submitted privately to College dean Rakesh Khurana (details have not been made public), who rejected the proposal in January 2017. A few weeks later, freshman dean Tom Dingman and Khurana responded with their own op-ed, arguing that the bridge program is “too narrowly focused” and that “sustained support” is critical for addressing the needs of first-generation and low-income students. Their solutions included increasing awareness about support resources, partly through a new Wintersession program to help freshmen “reflect on their fall semester, familiarize themselves with the College’s academic and support resources, and plan for their spring semester.” They also called for programs to provide academic support (citing the success of Expos 10, a course that introduces the fundamentals of academic writing), and for shifting the College’s culture to become more inclusive. The College also plans to hire a part-time “First-Gen Low-Income Student Advocate” within the FDO, to help such students “navigate any academic, personal, financial, or social hurdles they may face,” Steele wrote in an email statement to the Crimson. (Khurana, Dingman, and Steele declined to be interviewed for this article.) Two weeks later, Dorm Crew announced changes to its Fall Clean-Up program (which employs incoming freshmen to clean dorms before the academic year): the program will cover the cost of students’ meals, shorten its work hours, and add required advising sessions on the transition to college. Some students read the announcement as a smaller-scale bridge program, and criticized the College for tacking it onto a custodial program (it also became the subject of a very funny spoof in Satire V). Despite Khurana’s rebuff, campaigning for the bridge program is far from over. Barros notes that FGSU is continuing to talk with the administration about possible bridge programs. And announcements from the College about programming and support for first-generation students are forthcoming in the next few weeks, before freshmen arrive in Cambridge. Alisha Ukani ’20 is this magazine’s 2017 Daniel Steiner Undergraduate Editorial Fellow.